Monday I did some fabric painting and this morning I started playing around with the flowery shapes. I want to make a field of flowers with a few blooms standing out in the foreground. 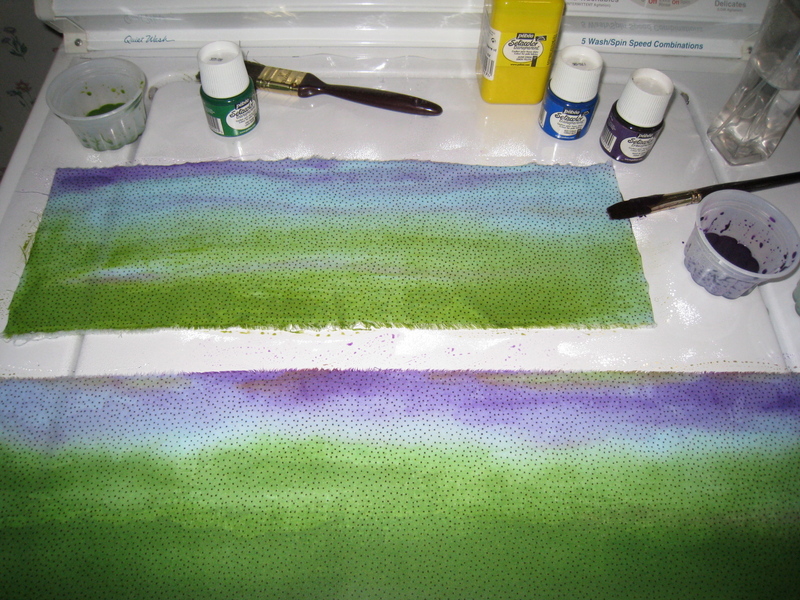 I started cutting into one piece of painted fabric, using the second piece as a background. I'll be overpainting the background piece and using thread to define the main flowers. Just a fun, springy piece which I hope to finish later today! Also, I was thrilled to receive some beautiful cards which I had ordered from my blogging friend, Libby Fife. Libby is a painter whose work I have followed for several years. 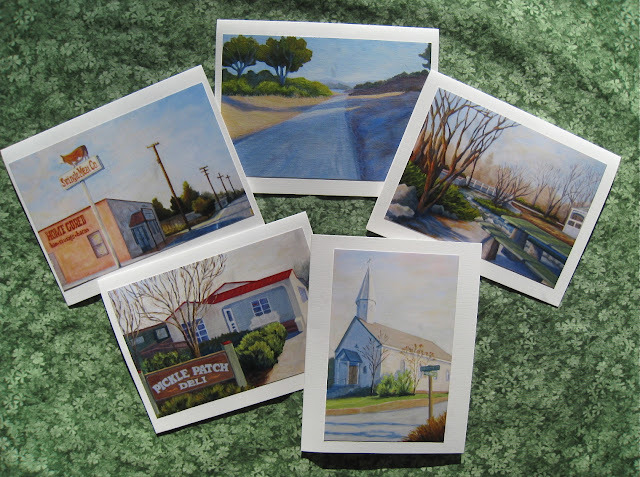 She paints local scenes from Calaveras County, CA, where she lives, and she writes about these scenes here. I purchased 10 cards - these are my favorites, but I love all of Libby's paintings! Hope your week is going well! Thanks for visiting! Today I did one of my favorite things - painting on fabric. I set up in my laundry room with a sheet of plastic over my washer and dryer, took out my Setacolor fabric paints and got to work. My first effort was a familiar one for me - landscape colors on a commercial fabric. Completely brainless, just the wonderful feeling of spreading the paint. The next piece was done with an eye to later cutting up and reassembling. Just working wet paint into damp fabric, trying different things. And finally, some sponge stamping and a little textural effect with a stencil brush. I really want to do another layer over this when I've heat set it. Throughout the entire process, Rosie watched, fascinated. Her favorite part was watching me wash up my brushes and containers! Don't worry, she didn't drink the soap suds! On a different subject, I was tagged this weekend by Lorinda at Everyday Endeavors. I don't usually do tags or blog awards, but I love Lorinda and her desire to learn new things. She is always coming up with new art projects and taking courses. She is also very funny and does beautiful work. 1. What's your favourite medium for creating? 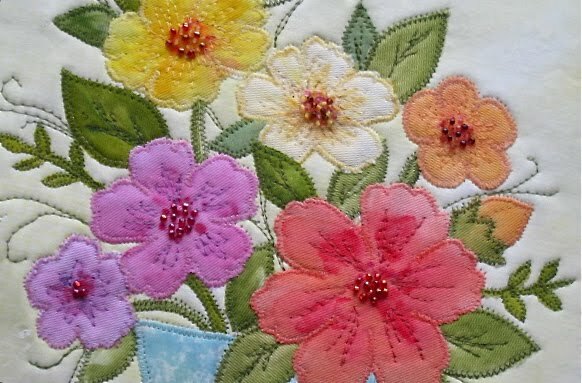 I love working with fabric, paper and embellishments. 2. What is your favourite accessory? 3. Books or movies? Or? My husband and I love going to the movies and we go often! I love to get lost in a film. 4. Is creating your day job or your night job? Creating is my passion and my fun! I do a little tutoring part-time. 5. Glass half empty or half full? Half full! I'm very blessed. 6. What's your favourite time of day? 7. What's your favourite form of exercise and/or physical expression? I'm doing a Pilates mat class right now. 8. What kind of music inspires you? I like Jazz. Ella Fitzgerald and Louis Armstrong were wonderful together. 9. What's your favourite month of the year? 10. What's your favorite quote? I would go back to Tuscany for an fiber art course and vacation! I told Lorinda that I won't be tagging anyone else, but if you visit her blog you will find many links to other artists who have been tagged. I hope that you have had a very good start to your week. It all started yesterday, when our temperature reached an unseasonable 85 degrees. I looked out from our porch and saw that our hedge of forsythias had suddenly bloomed - and I mean suddenly! These are the bushes below the porch windows. In the front yard, the daffodils are about to pop! And the pansies in front of the supermarket were lovely! And some even found their way home with me! And the lemons seemed especially golden! Maybe the sunshine affected my brain, but the whole day seemed particularly brilliant! 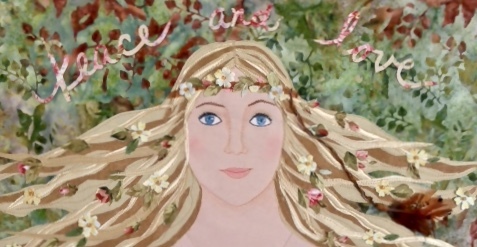 Here's wishing everyone a very Happy Spring!!! This morning I was thinking about compassion, and began drawing this sketch as I drank my morning coffee. I was thinking about how much we need the comfort of a human touch when we feel sad or overwhelmed. But, if that's not possible, even the sound of some comforting words or the connection that comes from a sympathetic glance can act as a salve on our wounded hearts. And, of course, a mother's touch can make all the difference to a troubled little soul! I spent some time out on the porch, turned on the electric heater and set to work with my pens, pencil, scissors and glue. The light in this room is phenomenal and, even on an overcast day like today, it is a pleasure to work out there. Keeping me company was my new laptop, which I am so thrilled to have! Although I've had a mac for five years, I'm taking lessons at the Apple store to really learn all the ins and outs of this wonderful machine. It's funny, though - I really love the simplicity of a pencil or pen in my hand, and like to keep a balance between hands-on and computer-created. Now to hand-write some notes to a few people I know who could really use some compassion and a little lift. It's so easy to get caught up in my own concerns - time to spread a little sunshine around!! Hope you are having a happy and sunny weekend!! I recently completed this commissioned portrait, derived from a photo taken in the 1960's of a most adorable young girl. The medium is cut paper, and the face was done with micron pens and colored pencils. I used acrylic paint for details on the cat's face. The cat, by the way, was not in the original photo! Before sending it off to my customer, who is also a dear friend, I added a brighter sparkle to the girl's eyes and a few more highlights to her hair. Unfortunately I didn't get a photo of those final touches. It's always rewarding to finish a promised project, and I have another one in progress as I write this. Hope everyone who reads this is having a very good week! I finished up a couple of collages in the last few days. The first included the pen and ink picture of my mom which I had made recently, done from a photo taken when she was 21 years old. The second collage was based on a silk screen print of a leaf I made with the help of my friend Andrea, who is a surface design artist. On Saturday, Andrea and I gave a demonstration for members of our arts collaborative. Andrea did a great job showing how to silkscreen easily with an embroidery hoop and a piece of screening which can be purchased at an art supply store. She also explained more traditional methods. These pictures aren't that great, but Andrea made it look pretty simple. I'm going to give it a try later this week and will do a post about it with better pictures. I did my part talking about collage, using examples of my own work and that of others. I have to say, we had the greatest group, with plenty of questions and lots of laughs. It helped that we knew nearly every person who walked in the door! It was a good experience and I definitely learned a lot! I hope everyone who reads this has had a very good first full week of March! Here in New England we've had a variety of weather - very cold at the beginning of the week, leading up to warmer days midweek, extremely windy weather last night and back down to the 30's today! It has been said about New England, 'If you don't like the weather, wait a minute', and that can be very true at times! On Tuesday, I went to my Pilates class in the morning, but felt a bit "off" as the day progressed. By night time I was experiencing the full impact of a stomach virus which left me out of commission for a couple of days. I'm feeling better now and apologize for missing the latest posts on my favorite blogs. I'll be catching up in the days to come. One thing I could do, while lying on a bed flanked by two cats, was to create a magazine photo collage to use as an example in a collage demo I'll be part of tomorrow afternoon. I have to make a confession - I love to clip photos and illustrations from magazines and, rather than let them sit in files and folders, I really enjoy making collages with them. It's a low key creative activity which can be done in the evening while watching TV. When I put my magazines out to be recycled, they've already been recycled to a certain extent! The photos in this collage were culled from several magazines. I was thinking of adding a word or two to it, but right now I'm enjoying it as it is. I have a lovely blank journal, hand made by artist Sue Bleiweiss, which has heavy enough pages to use as a collage book. These are a couple of my favorite pages from that. I do enjoy adding words, hand drawn sketches and little curlicues to these pages. Easy, creative fun! I'll be gathering more examples of collage as today progresses and hope to post them tomorrow! What are you looking forward to this weekend? Hope it's something good! I love a new week, full of promise and the possibility of wonderful things happening!! I've been visiting my favorite blogs and noticing an upswing in people's sprits as Spring approaches, and I feel it too! Today is bursting with sunshine and we are promised much warmer weather as the week goes on! This past Friday I had the privilege of being part of a small exhibit during the grand opening of a terrific gift shop in our town. As I scurried to finish a fabric and felted landscape, but didn't quite make it, I instead settled on two cut paper pieces I had done awhile ago. As it turned out, my work was hung next to some beautiful felted pieces by another artist, so it was good to have work in different media. It looks a bit confusing, but there are two levels in the store and this wall overhangs the lower level! These are the pieces I put in the exhibit. 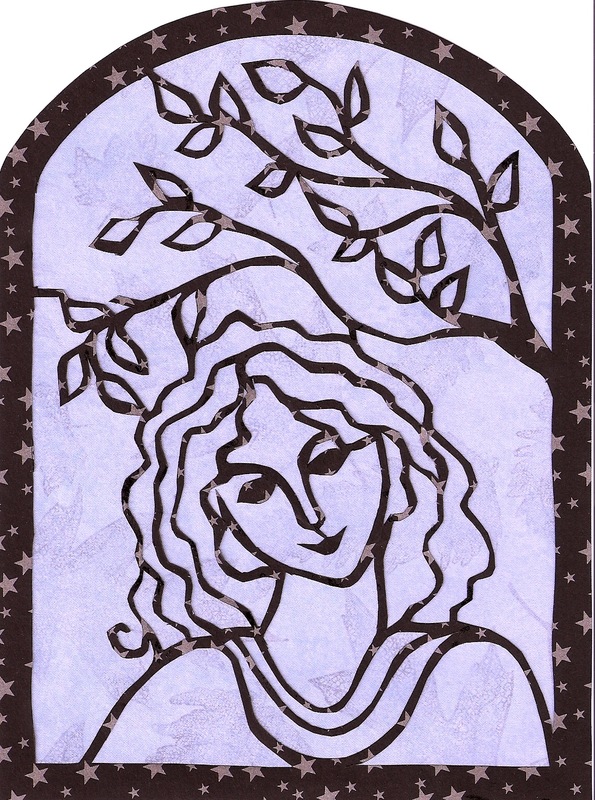 And this coming weekend I'll be doing a demonstration, with my friend Andrea, of different types of collage (Andrea will be demonstrating silk screen printing), so this week I'll be posting some examples of collage as I prepare them for the demonstration. Wishing the happiest of birthdays to my very dear daughter, Kate. Sometimes I begin a fiber picture, get off to a good start, and then lose interest because I'm not sure where to go with it. Last November I began this one, inspired by some textured fabrics with beautiful frayed edges. I layered them against a hand painted, cotton fabric sky. I knew that I wanted the foreground to move forward, so I tried some suede-like fabric, folded over a thin batting. In early February this year, I found the picture in a pile of fabric and gave it another look. This time, I used a green print cotton fabric, once again trying to create volume by gathering it a bit, and added a bit of wool roving in the background to suggest foliage. Yesterday, I came across this piece again, once again neglected and unfinished - poor thing!! I set to work, attaching a piece of wool to the bottom and pulled out the wool roving I've been collecting for ages. I wanted it to build up the depth of the foreground and add interest and balance to the piece, so I spent some time needle felting with hues of green and raspberry. Of course, a little beading always helps to add contrasting sparkle! The weather is so gray today, I took two different photos of the piece in different lights. There is a hint of lilac in the sky, but it's hard to capture in a photo. I'm so happy I went with the wool roving and love the texture it provided. Speaking of gray weather, we finally had a bit of snow last night and today. Here's the view from my porch!